To help designers in planning fasteners on future projects with metric dimensions, this catalog differentiates between Palnut® fasteners already tooled for production and those which have been designed and not yet tooled. The fasteners already available are indicated by part number and dimensions printed against a white background. Those fasteners planned for the future are indicated by dimensions printed against a green screen. As the demand increases for fasteners with metric dimensions, tooling for these sizes will be added. There is no fixed schedule for bringing any particular new fasteners into production. If your plans call for using metric fasteners, it is suggested you contact us for information about when the sizes you need may be available. Palnut® self-threading nuts and Pushnut® fasteners are respectively turned on and pushed on non-threaded projections, or "studs". These fasteners eliminate the cost of cutting threads and the problems of cross-threading. They permit simpler, more economical and usually better designs. With these fasteners, there is no thread to find and no binding from dirt or damaged threads. Because of their prevailing torque, the fasteners provide excellent vibration resistance. Stud materials, which must be appreciably softer than that of the fasteners, include die cast zinc, aluminum, molded plastics, steel and brass. 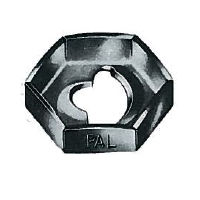 Palnut® lock nuts incorporate a design principle that has stood the test of over 60 years. These nuts may be used alone for load-carrying in light-duty assemblies or they may be used on top of ordinary nuts to assure tightness of high-stress assemblies. They offer impressive savings over alternative fasteners in initial cost, assembly time, weight and space. They are removable, reusable, self-cleaning. They are unaffected by temperatures up to 400°. 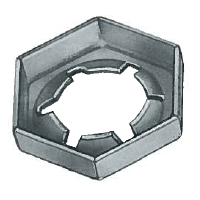 Tension nuts are preassembled on adjusting screws to a predetermined point. Subsequent turning of the screw advances the tension nut until it touches the work. Barbs on the nut base then "bite" and resist further turning. 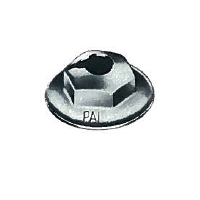 On-sert fasteners are pressed onto hollow platic bosses where they minimize splitting and stripping. 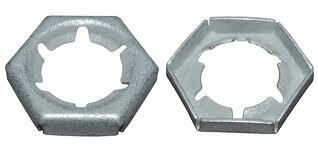 Pushnut bolt retainers are temporary fasteners that hold pre-inserted bolts in place until they reach final assembly.